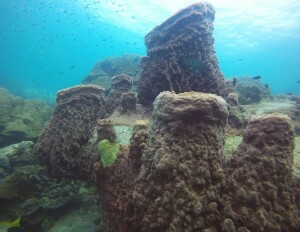 Pattaya snorkelling trip s at Pattaya coral islands, a great way to spend a day while on holiday. 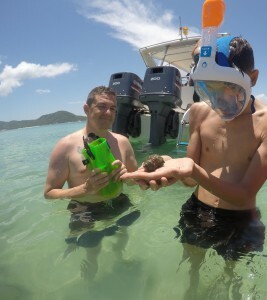 You can spend the day snorkelling and exploring the shallow coral reefs which have tropical fish/marine-life and corals to see. There are no big sharks in Pattaya which for some is a good thing, you actually have a lot more chance of seeing marine-life such as turtles, butterfly fish and tropical coral fish while you are snorkelling at the Pattaya islands. No more early mornings as we start these trips with a 9.30am pick up from your hotel and return at 3pm-ish. We have a 12 metre twin engine speedboat to take us to the near or far islands coral reefs so we don’t have the 2 hour boat travel such as the larger boats. A Divemaster will supervise your activities and issue you with Mask, snorkel, fins and safety vest and brief you on the best places to go whats to see and what to watch out for. It takes us only 15 minutes to the near islands and 30 minutes to the far islands in our 12 metre twin engine speedboat. 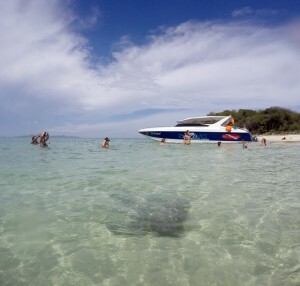 Once at the island we will give you briefing on where to go, safety tips and what to look for. 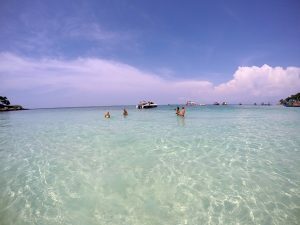 Most of the islands have some really nice beaches where you can sit and relax between your snorkeling/scuba diving and catch up on your sun tan or you can sit on the boat. We make sure we get the boat nice and close to the beach/snorkeling sites so there are no long surface swims like on the larger boats. noon we move the boat to a different coral site and the Divemaster will give you all the information you need to know on the new site. 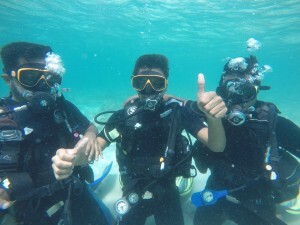 If you would like to try scuba diving for the first time? you can also do this on this trip. 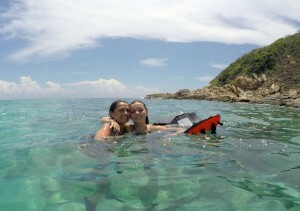 Try scuba diving in the morning and snorkelling in the afternoon, makes a great day out on the islands. Mask, Snorkel, Fins and safety jacket.